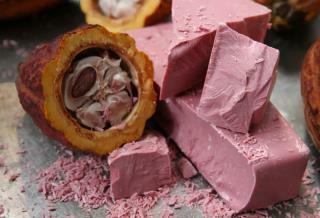 (Newser) – A Swiss company has laid claim to inventing a new kind of chocolate—and it's pink. "Ruby chocolate," made from ruby cocoa beans, is being hailed as the first new type of naturally hued chocolate since the white version hit the market more than 80 years ago, Bloomberg reports. In a news release, maker Barry Callebaut calls the sweet treat, debuted in Shanghai on Tuesday, "an intense sensorial delight" with "a tension between berry-fruitiness and luscious smoothness." The company's scientists stumbled on the idea 13 years ago while studying ruby cocoa beans, sourced from the Ivory Coast, Ecuador, and Brazil, per Bloomberg. The color comes naturally from the powder extracted from the beans, with no additives. Adding some dye to white chocolate wouldn't produce the same flavor, the company says. I didn't realize Nestle or Hersey made chocolate. Please do not slash the workers! The only bad chocolate is the fake chocolate. Bring it on....yummy. I hope.